REFFLEX® PTFE (“Teflon”) flexible 160 bar hose for CO2 (R744) and for NH3 (R717) - Refflex International B.V.
A new range of hoses for these applications is now available. 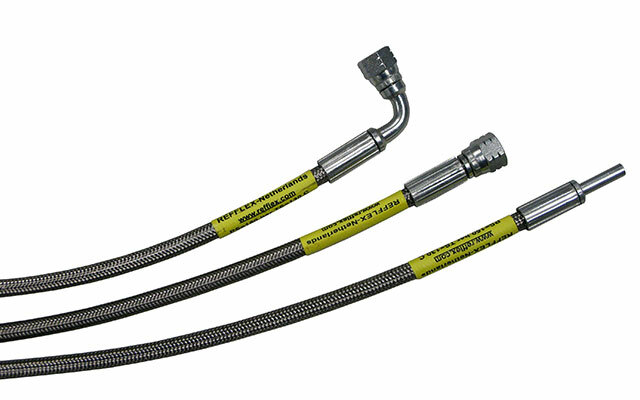 The basic design is a DN-5.0 mm hose, made of PTFE (“Teflon”), reinforced with a single-layer braid of stainless steel wires and with suitable fittings. The PTFE-compound, along with the stainless steel braid, allows for the typical pressure-temperature conditions involved with transcritical CO2 systems. These prefabricated hoses can be used in subcritical systems and with ammonia as well.